I though I'd gather together all of my Amethyst: Princess of Gemworld stuff onto one page :) For those that don't know, she is an older DC character that was a precursor to She-Ra. 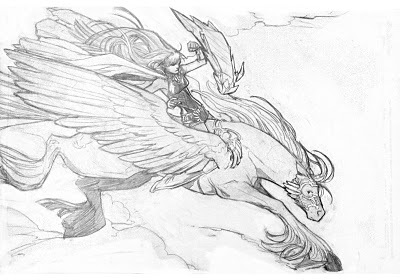 The old comics were full of fantasy, magic, pegasus, pastel crystals, and everything else you can't help but love about 80's properties ;) I found out about her on a tour of the DC offices in 2008, and I've spent years since re-creating her original tale in an updated manner. Not only do I just LOVE the story and character, but I feel that Amethyst done correctly, would absolutely bring in a whole new readership to comics in general. Someday I would love to write as well as draw this. It would be all ages (nothing worse than Harry Potter anyway) and would be an updated version of the original Maxi Series (so think Dark Opal, Princess Emerald, Granch, towering crystals, trees with faces, the whole kaboodle ;)). As with the original, it would be a tale of high fantasy, adventure, and love. Below you'll find parts of my pitch that I sent to DC. Earlier this year I was considered for the new Amethyst series as artist, but they went another direction. I am absolutely honored to have even been considered and it was a wonderful experience! 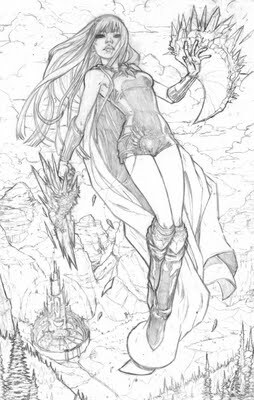 :) I feel the artist they picked is perfect for the new story. But my passion will always lie with telling my version of Amethyst, so I'll keep up hope someday DC will give me that chance. Amy Winston, a 13 year old of Gotham is stolen away to another world full of magic and horrors. There she discovers her destiny as princess and heir of the ruling domain of Amethyst. An ancient evil seeking to devour the planet attempts to destroy her while Amy learns how to wield newfound powers with hopes of becoming the savior of the Universe. 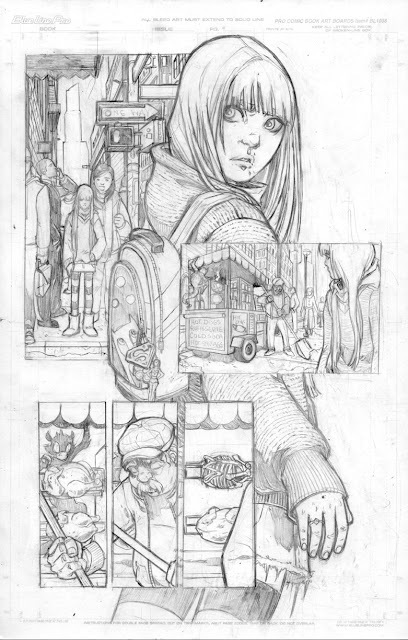 AMY WINSTON is an almost 13 year old girl that lives with her father in a small apartment in the slums of Gotham. Her father of the GCPD (Gotham City Police Department) is always working in an effort to provide Amy with a stable home. However, perplexed on how to properly take care of an almost teen daughter, he leaves Amy to take care for herself most the time, which she actually prefers. She is a quiet, shy girl who aims to be invisible, both to her peers as well as to remain unnoticed on the dangerous streets of Gotham. Inside she is intelligent, bold, and harbors a fierce admiration of Wonder Woman (whose poster graces the wall of Amy's bedroom.) She spends her time wandering the city, which she finds fascinating. 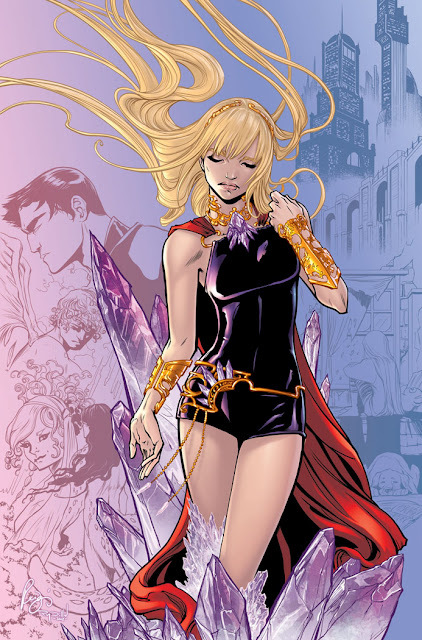 Amy is in reality the daughter of King and Queen Amethyst, the ruling domain of Gemworld. Her real father and mother were married out of political convenience, both good fair people, but not in love. When 7 months pregnant, Queen Amethyst ran away with Citrina’s help to Earth, to hide from Dark Opals murderous onslaught. She finds herself in Gotham. Lost, afraid, but in awe of the city, she meets Amy’s future step-father. He helps Queen Amethyst find her feet in the new world, and soon they fall in love and become married. Amy is thrust into a struggle for balance. On Earth she is a quiet, unnoticed girl with hardly any friends or family. On Gemworld she is a warrior Princess where every person on the planet knows her name. Countless people love her and count on her to save them from Dark Opal. GEMWORLD This world is the oldest of planets. The true name has been lost to time, however Amy affectionately decides to call it “Gemworld”. The planet is small but rules a massive power that holds the universe together by way of twelve precious gems. The “birthstone” references actually originate from Gemworld, but over millions of years those same stones have made their way to Earth as well which is why Earth is tied so intracately to Gemworld. DARK OPAL House OPAL consisted of peaceful monks living far beneath the world. They practiced magick with the intent of healing and working with souls of the dead for peaceful purposes. A zealot prince of their time, named Markuz decides to stretch the boundaries by calling upon souls of the dead, and opens himself too far. The Dark Evil pounces, and violently takes over Markuz’s body. His wife and best friend happened to be too close at this time, so their bodies and spirit were also trapped within Markuz (their faces can be seen on Dark Opals shoulders, sometimes they speak). Markuz then becomes Dark Opal, a creature so demonic and powerful many houses, including Opal and Carnelian, quickly fall to his whim. He retains a banded blue and black appearance, and can shape shift into various creatures. Amy lives in a dangerous neighborhood of Gotham. Her father is an officer for GCPD (Gotham City Police Department). He is a stolid, good man who (after Amy’s mother’s death 10 years prior) doesn’t really know how to best care for his daughter. 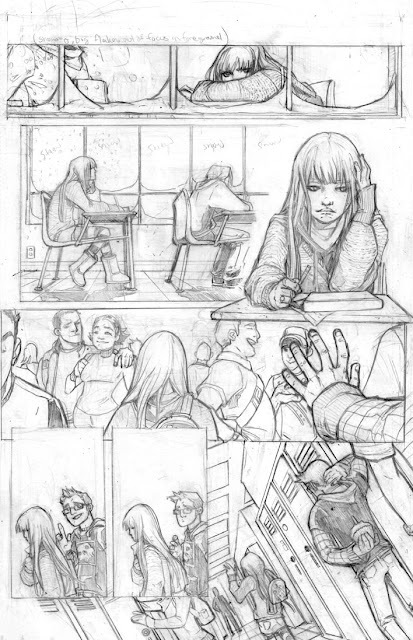 Every day Amy walks to South Gotham Junior High through the dangerous city. She aims to be invisible, to avoid both peers and the violence Gotham City can bring. Inward she is strong, bold and intelligent beyond her years (almost strangely so). Though most comply with her need to be invisible, some do take notice. As her 13th Birthday approaches, a small creature starts to follow her around the city. It slips a gem ring into a birthday present left in her room. The gem is revealed to her to be an Amethyst, and she soon starts to hear whispers and odd color shifting in things around her. The night of her birthday a large demon bursts through her closet and steals her away to a new world. She awakens in a dark dungeon far underground. There she discovers many skeletons, half buried in the soft sand. Granch, a scarred, battle worn Pantaur reveals himself, chained to the wall as a prisoner. He warns her to not move as there are giant worms sensitive to movement that devour prisoners. 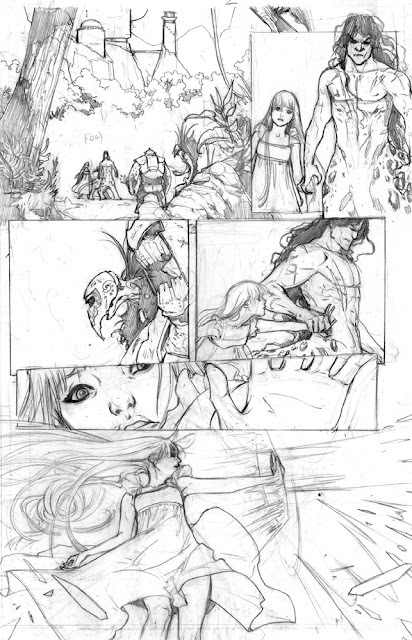 She and Granch collaborate to escape, however Granch disappears leaving her to escape the giant castle (which she later discovers is the Carnelian Castle, catching a glimpse of Topaz and Dark Opal along the way) by herself. She’s then pursued into the outlying jungle by horrible creatures. Granch appears before she’s killed, and demands for her to use her powers. Not knowing what he’s talking about, Amy cannot obey. 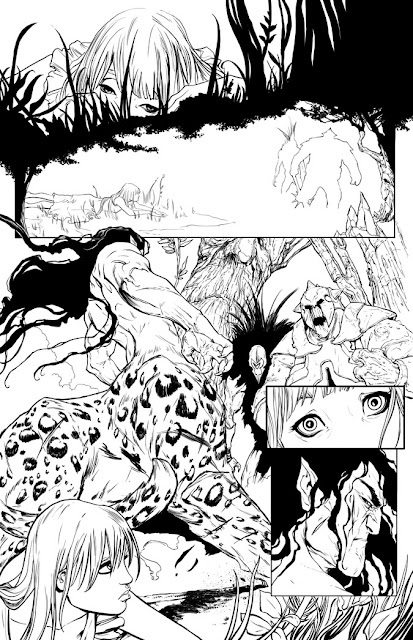 Granch pushes her hand outward toward the enemies, and her instinctual powers are unleashed, destroying the foes. Granch reveals to Amy who she really is, Princess Amethyst, heir to the vast powers of the Ruling House of this world. He explains briefly that the planet, ruled by 12 precious and powerful stones, is so old that its name has been lost to the eons. Amy from then on calls it Gemworld. Granch decides to help her, but makes it known he also hates her, for reasons he won’t tell. Confused by his anger, she has no choice to accept. Onward they go on their first quest, to find Citrina, the good witch woman who has been steward of Amethyst since the House of Amethyst was destroyed. She soon discovers a horrific evil, The Lord Dark Opal, has set out to find and destroy her. She wants to go home but cannot, and Granch tells her only Citrina may know a way. And there the adventure begins. Absolutely GORGEOUS. DC must be completely insane to have chosen someone else, and not thrown bags of gold at your feet along with a loud "Yes! Amethyst is yours!". Bah. They'll realise their mistake soon enough. DC really was stupid for not letting you have a go at the book, even if just as the artist. Just another in a long list of stupid editorial decisions. I'm not knocking the artist presently on the book he's good too, I like Lopresti's work, but your work just screams to be on the book ... its beautiful. My advice, do your own story. I'd write something for you just to see your beautiful art. Seriously. Now, this is a book I'd love to see published so I can get my daughter into comic books. So, I spotted your Amethyst online at Deviantart a few months ago and I asked JK woodward to do this commission for me with the basics of your Amethyst w/the new Zatanna :) JK Woodward Amethyst/Zee I thought you'd like to see it. Wow so happy to have found your and your beautiful work here on blogger. ^_^ Your work is always so amazing to look at. Hi! I really, really like your artwork and your pitch for the Amethyst comic. I'm sorry to say but I was very disappointed by DC's reboot. I wish DC had hired you instead! I'm a child of the eighties and the original 12 issue maxi-series was my favorite comic book series. Have you seen the four issue mini-series that came out years later with artwork by Esteban Maroto? In that series they made Gemworld into the Sorcerer's planet from the Legion of Superheroes comic.